I went down to the garage last night try out the new dovetail saw, but got distracted and worked on the bow saw frame instead. I’m starting with some random Oak I picked up from I have no idea where, but it’s stout and available, so it will do. I’m not following any set plans for this, just kind of winging it which is probably a bad idea. 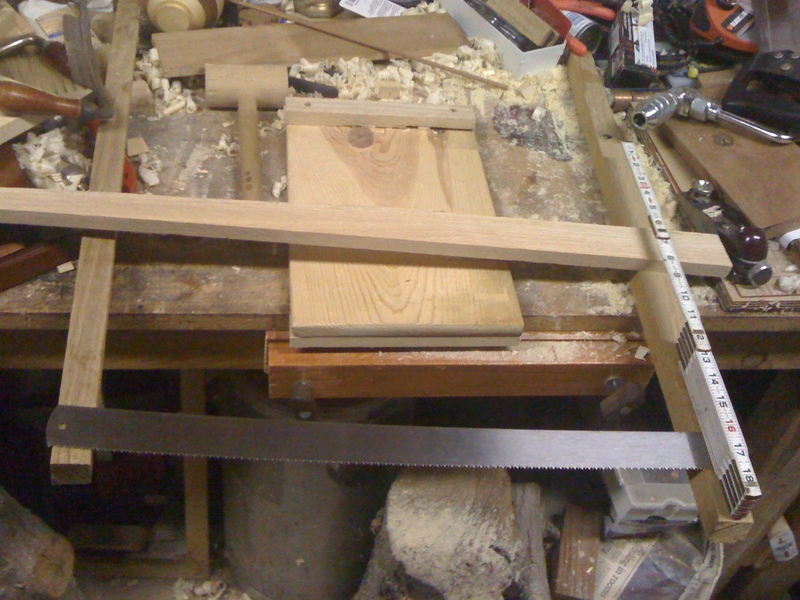 I’m using the blade I bough from Traditional Woodworker that is 24″ blade with a 9 TPI filed for cross cutting. 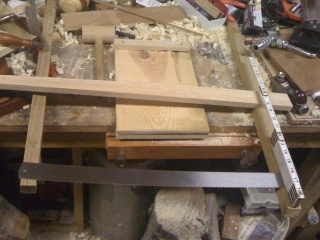 I have a 5 TPI rip blade as well, that I am thinking of making into a frame saw later. I laid out the blade, and used my little one for the rough proportions to use. I cut a couple of 4″ sections to use as the handles, and set to work on those. The metal shank is 1/4″ bolt which am embedding in the handle. I started with a #4 auger bit (1/4″) in my new/old brace I got a coupe weeks ago, and then drilled a #8 (1/2″) hold for the head. I should have done it in reverse I think, since the bigger hole was slightly offset, which might have worked in my favor. Small admission, I didn’t exclusively use hand tools for the drilling, I did start the hole with the drill press, but it wasn’t long enough. The brace and auger set up does work well, better than I expected, but it still had some issues. I’m still debating how far down the path I want to go and how fast. 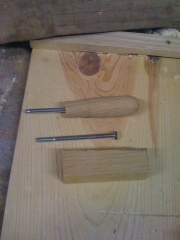 Once I had the holes drilled, which was a small challenge using these in my non wood working vise (all I have for now) and at that height of my bench currently. As I said the holes were not perfectly in line, which meant I could wedge the bolt down in the hole, and it was stuck fast. the shank is not straight out of the handle though, so it might be a problem later. We shall see. Once I had enough shaft poking out of the end, I chucked it up in my lathe (60 year old Shopsmith 10-ER) drill head, and turned the handle round. I didn’t try for anything fancy, this is one is going to be pretty rough I think since I’m not putting much thought into appearance. I might make another frame later, depending on how this one goes. 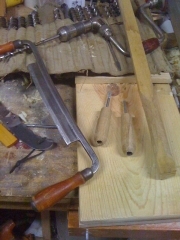 Then I put the oak into my bench vise, and started hacking at it with the drawknife. I use the word “hacking” deliberately, because again I wasn’t putting a lot of thought into this part. Mostly I just wanted to see what it could do, and then just kept going. Needs some sharpening but it did a fine job of removing stock as it was. I have a decent handle going already, and I’ll layout a more coherant plan on my next visit to the shop. 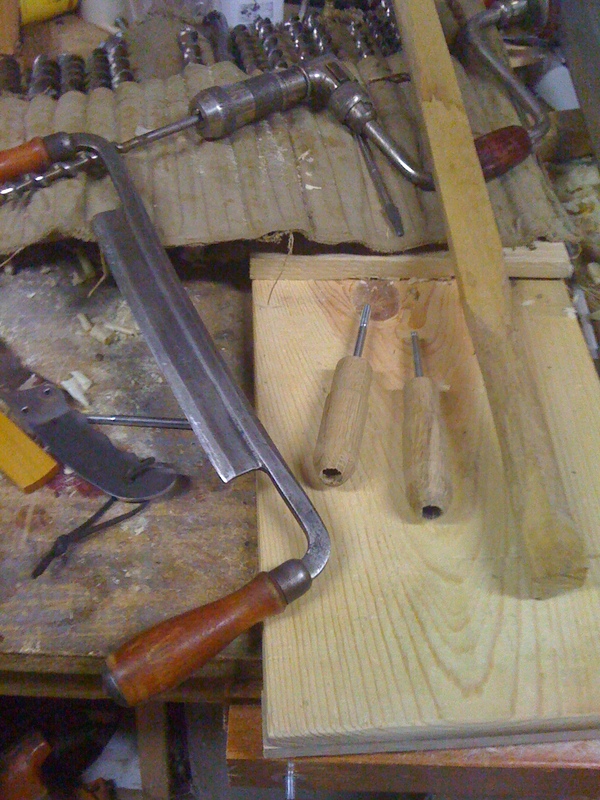 I wish I had a spokeshave, or more to the point I wish the crappy Harbor Frieght spokeshave wasn’t so crappy. I know, I know, you get what you pay for, and boy howdy I didn’t pay much for this one. I didn’t have high expectations for these, and even then it didn’t work. I might try sharpening again, or maybe just toss them.